Welcome to the Tea Party: Whose party is it? Protesters gather on Capitol Hill during the Tea Party Express rally on September 12, 2009 in Washington, DC. Once written off by Democrats as "astroturf" (Washington-speak for faux grassroots) and a word that rhymes with "fleabaggers," tea party activists across the country are proving the skeptics wrong. Scott Brown's tea party-infused upset in the Massachusetts Senate race stopped health care reform in its tracks. A tea party two-fer. Still, ask around and many Americans are wondering, "who are these tea party guys?" So that's what we did. In part one of our series, "Welcome to the Tea Party," we went to some rallies, talked to two of the major tea party outfits and zeroed in on one activist in the movement who's worried it's being co-opted by the Republican Party. Here's what we've found. The tea party is not astroturf. It's a booming movement of conservatives and independents. Many of the activists don't like President Obama. But some are just as mad at the GOP. Much of the anger is fueled by the bailouts and runaway deficits. And one thing is clear, the activists are not going away. As for that activist who is worried Republican Party operatives are circling his movement – that part is true. On Wednesday's American Morning, we've got a behind-the-scenes look at the Tea Party Express, the popular conservative bus tour that swept the nation. We're not riding the bus. Instead, we visit the group's offices, located – get this – inside a Republican political consulting firm. Tell us what you think about the Tea Party movement. And don't forget to watch parts two and three on American Morning. Here's a two word preview: Marco Rubio. Editor's Note: Tuesday’s American Morning audience expressed deep concern for Haiti’s orphans. Some who were already in the process of adopting children from the country shared the very thorough vetting process that takes place in order to adopt. Others suggested alternative options to adopting, such as sponsoring children in-country who can stay with loved ones but benefit from assistance. Jennifer: I am a 44 year old single woman who has chosen adoption to start a family. I began this long and complex adoption process in August of 2009. The country I have chosen to adopt from is Haiti; I made that decision over 5 months ago and have followed all of the guidelines and met all of the government requirements to the fullest. I am one of the 900 or so people estimated to be "already in the process" of adopting from Haiti. My paperwork had been scheduled to be sent to the Haitian embassy the week of the earthquake. Adoption is not a quick process; there is a home study process that takes a minimum of 6 weeks; government approval that can take 6-8 weeks; dossier preparation that can take months. There are legitimate people like myself in this world whose lives have been scrutinized, back-ground checked, interviewed, etc. and approved to adopt. It's unfortunate that this small group of people to which I belong are now being lumped in with others "rushing to adopt from Haiti". I have been praying that people like myself who started this process long before the earthquake will not be categorized as people trying to wrest non-legitimate orphans from the streets of Haiti. Before the earthquake there were over 400,000 orphans in Haiti and a great need for international adoption; the country welcomed adoption from the U.S. and other countries. Now it seems that out of valid fears of child trafficking and exacerbated by the naive acts of the church missionaries, all of us trying to adopt from Haiti get a bad name. I'm a single woman who tried for years unsuccessfully to get pregnant through artificial insemination; adoption was the route I chose to have a family and gave me hope for a joyous future. Please remember that there are many of us out there with legitimate hopes and plans to adopt from Haiti. I pray every day that when the country is ready, the Haitian government will again open its doors to legitimate adoptive parents. My choice t o adopt is not out of some sudden humanitarian urge because of the scenes of the earthquake we have all seen on TV. This is my only hope for a family. Susan: Haiti children are beautiful, but here is some food for thought – I have an idea wouldn't it be better to send money to Haiti so families wouldn't have to be broken up. We have these organizations who sponsor children. Let's start sponsoring children over there and send food, clothing and money providing shelter, education etc., instead of having the families broken up. Now, if they have no families I can see adopting them. Those parents over there who gave their children over to these organization wanted them to have a better life and was doing this out of love for their children. Lets help families stay with their own blood families if we can first. Also, we have so many children as well, in the United States who are going hungry let's also help our own. These church organizations or any organization should do more in regards to helping the needy here in the USA and also adopting here in the USA. It they want black kids there are a lot of them here who can be adopted out. It's kind of shameful to see people sleeping on the streets and adults and children going hungry here in America. Let's clean up the homeland first. Sometimes we need to ask ourselves the question why there are so many African Americans and other children not being adopted out. 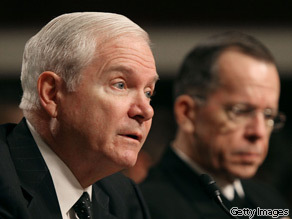 Defense Secretary Robert Gates (L) and Chairman of the Joint Chiefs of Staff Adm. Michael Mullen (R) participate in a Senate Armed Services Committee hearing on Capitol Hill on February 2, 2010. Washington (CNN) - The Pentagon has taken the first steps toward repealing the military's controversial "don't ask, don't tell" policy regarding gay and lesbian service members, Defense Secretary Robert Gates said Tuesday. Joint Chiefs of Staff Chairman Adm. Mike Mullen also endorsed a repeal Tuesday, telling the committee it is his "personal belief" that "allowing gays and lesbians to serve openly [in the military] would be the right thing to do." "For me, personally, it comes down to integrity," he said. "The question before us is not whether the military prepares to make this change, but how we best prepare for it," Gates told members of the Senate Armed Services Committee. "We have received our orders from the commander in chief and we are moving out accordingly." But the ultimate decision on whether to repeal the policy, he acknowledged, rests with Congress. You may feel like you're in good shape and the number on the scale may not be anything to worry about. But, new research is showing that just because you have a healthy weight, you may still actually be obese. Our Dr. Sanjay Gupta joined us on Tuesday's American Morning to explain how this could be possible. According to Pentagon sources, Defense Secretary Robert Gates is prepared to ask for up to a year to study the best way to repeal "Don't Ask, Don't Tell." Today's hearing on Capitol Hill comes on the heels of one key sentence in the president's State of the Union address last week. This year, I will work with Congress and our military to finally repeal the law that denies gay Americans the right to serve the country they love because of who they are. It's the right thing to do. We were joined on Tuesday's American Morning by Alex Nicholson, the executive director of Servicemembers United, an advocacy group that opposes the "Don't Ask, Don't Tell" policy. Nicholson is a former Army intelligence officer who was dismissed for being gay.